Killarney is a joyful place once more! Probably second only to Dublin in number of visitors, five years ago Killarney was a victim of the Great Recession in America and the Irish debt crisis. Now visitors have returned. Many large tour buses bring people to the hotels, restaurants and shops of the city. The band we enjoyed hearing and watching on in Killarney. Buskers are on the streets making people happy with their cheerful music. 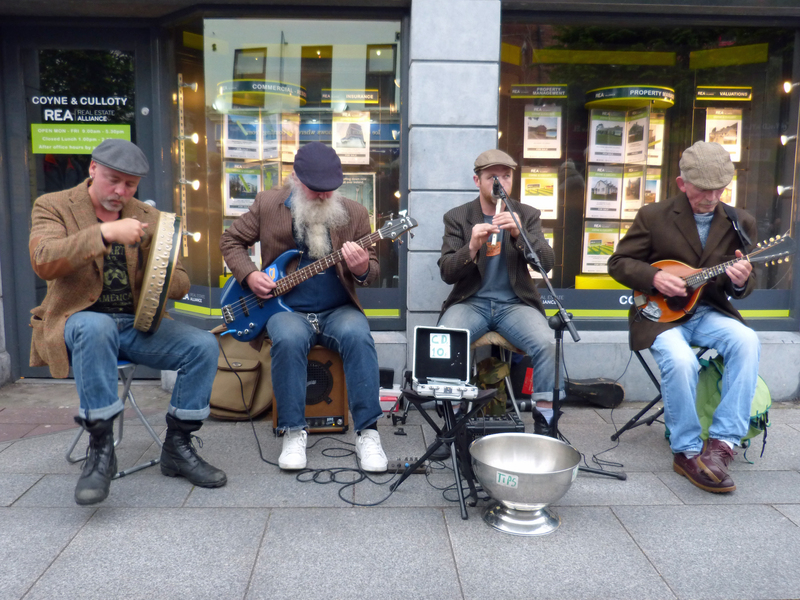 We found a four-piece band playing Irish jigs that drew a large crowd and inspired people to dance in the street. We also enjoyed listening to and conversing with an excellent singer called “Scottie” — especially when he played his Donald Trump song! Traditional Irish music is played in many Killarney pubs and on the streets seven nights a week. The castle remains behind The Lake Hotel in early morning light. Bee and I stayed at The Lake Hotel, a classic hostelry more than 100 years old. This very large hotel bills itself as “the hotel with the most beautiful view in the world.” I agree. I love staying here. 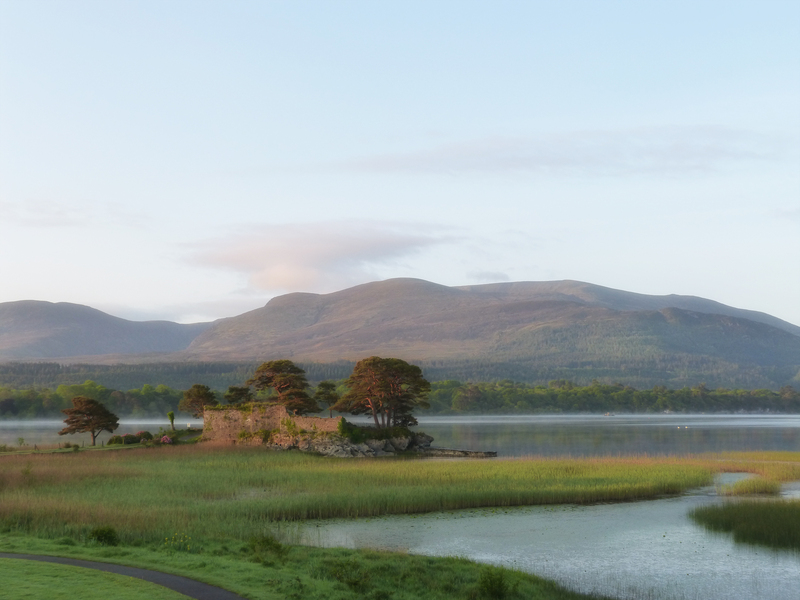 The rooms are large and overlook the lakes of the Killarney National Park and the mountains of Kerry. 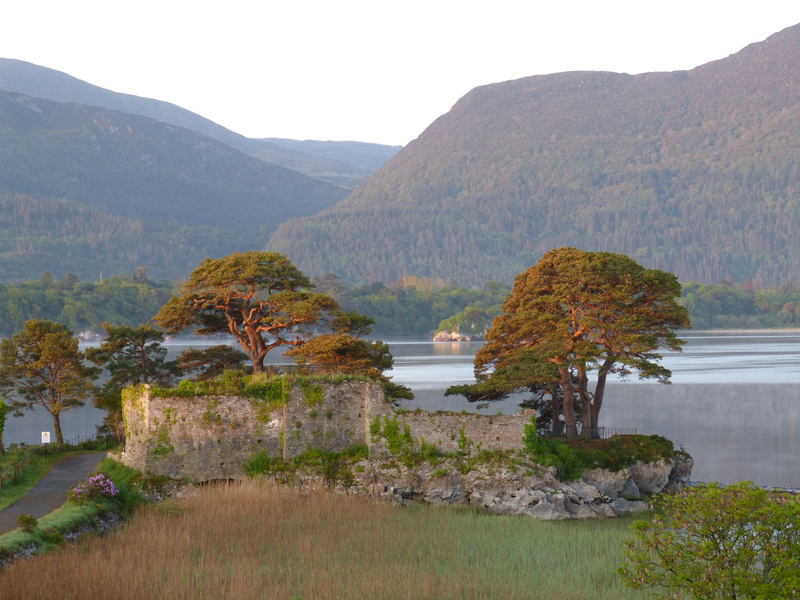 The remains of an old castle on the lake’s shoreline creates a magnetic focal point for visitors and photographers. 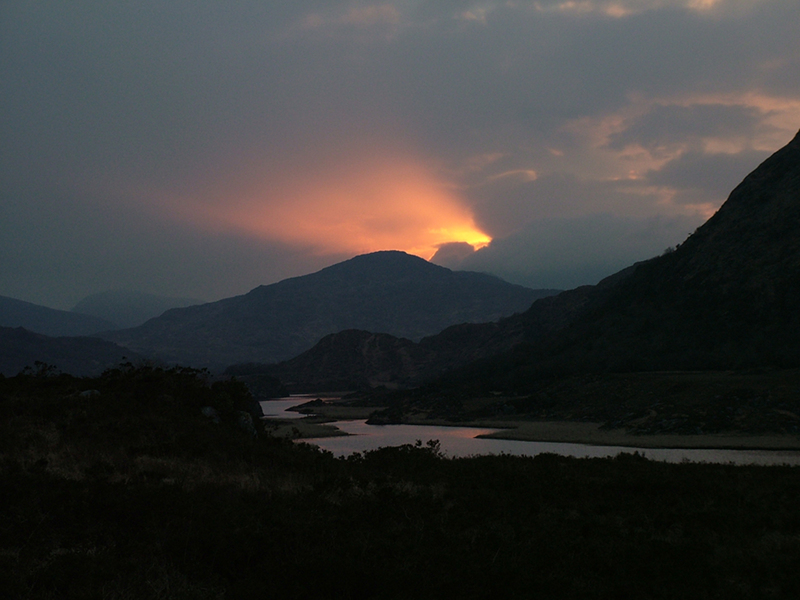 Agi Risko shot this beautiful picture of Ladies View when we were in Killarney together in 2005. 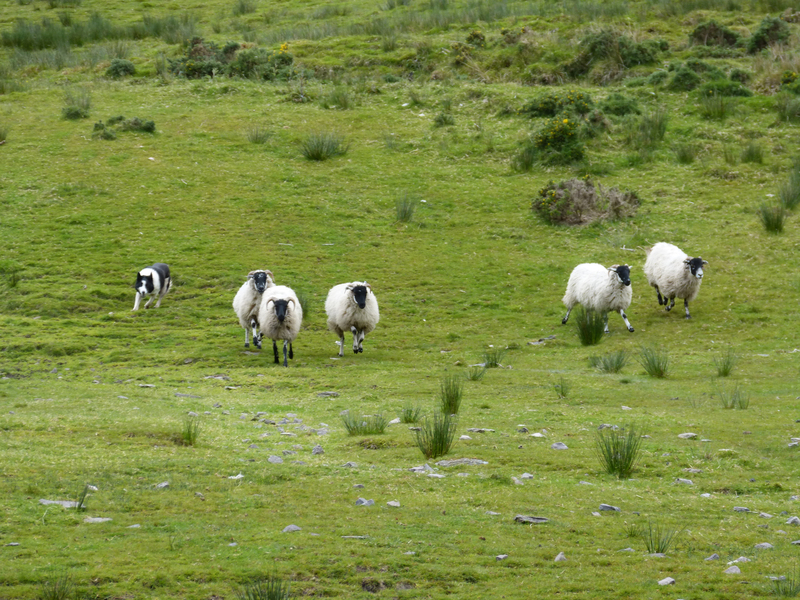 One of the collies herded the sheep down the hill. Our favorite stop on the tour was at Kells Sheep Dog Trial where we watched border collies perform their duties. Incredibly well trained, the dogs respond from 100 yards away to very low commands and short blasts from a high-pitched whistle. They manage herds of sheep better than people can. It was fun to watch them. I think most people agree that this is the best part of the tour. Someone has put a video on YouTube of the same place we visited. Now is a great time to visit County Kerry! This entry was posted in Ireland and tagged Killarney by Libbie Griffin. Bookmark the permalink. I’m definitely putting this on my to-do list! It’s so beautiful!! I hope you and Joe and Charlie will spend some time exploring Ireland one day. Perhaps like me you’ll keep coming back because it is so beautiful and because the people are so nice. Beautiful photos once more!!! Thanks Libbie!! Thanks Clare! This small island nation is filled with beautiful sights. The Trump song is gathering steam and I’ve sent off to the States for a Trump wig. I can feel the tension from ‘Murrican tourists.